A unique bullpup 9mm gets a new engineering home. This entry was posted in pistol, weapon and tagged 9x19, B3E, bullpup. Bookmark the permalink. Read the article but disagree with the last bit on the .45 It is fussy but it works well once you figure out the ammo it likes. 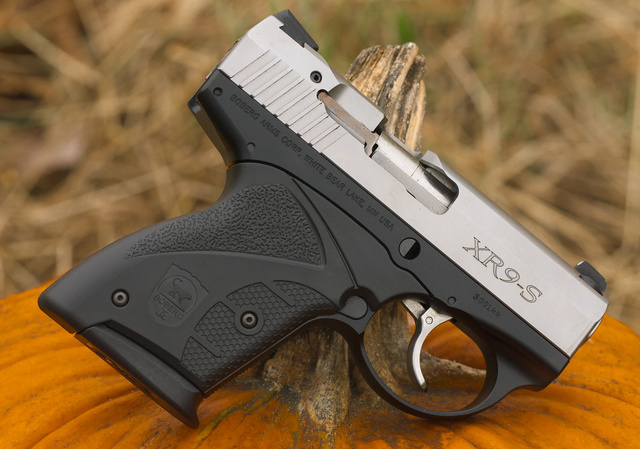 It’s amazingly small and convenient to carry, yet the action keeps it controllable. My sole experience with 45ACP were two pre-production guns….neither worked well or lasted long without breakage. Glad to hear production guns worked out. I have both an XR-9S and an XR45S. The former is quite reliable, the latter has frequent misfeeds. Most common is live round ejection. It’s clear from the discussion on the Boberg Forum that this is a common problem. It seems that the cause is the fact that the cartridge is not accurately positioned by the .45 magazine. In the 9 mm magazine, the cartridge is positioned by the case front, via a step in the magazine sides. In the .45, it is held by a clip that engages the case rim. But that clip doesn’t extend far enough upward, so the topmost round is not held. The result appears to be that the feed tongs don’t always engage the case rim. One owner cured this by gluing a thin wood strip into the front of the magazine, which relies on the cartridge overall length being sufficiently consistent. I’m going to try making the .45 magazine look like the 9 mm version. It sounds like Bond Arms is working on redesigning the .45 magazine because of these issues. I hope they will, because I like the .45 when it feeds right.